The breeding process differs from each butterfly species to the next. 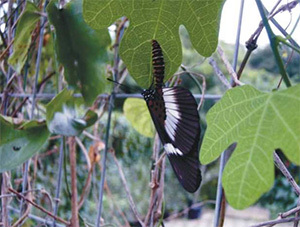 Our head breeder has been breeding butterflies for 45 years and has a vast knowledge of our South African Butterflies. All our staff are well trained and experts in the field of breeding butterflies for various locations throughout South Africa. One of the main objectives is to breed butterflies for release into our natural environments to enrich our butterfly populations and to increase their habitats with indigenous host plants where ever we can . Hence the release of butterflies at weddings/functions, which helps us to achieve this objective. Butterflies are monitored at our various Butterfly Breeding Centres. Here the eggs are collected after watching the females lay them in batches from 30 to about 80 eggs each. These are then removed and taken into custody by the breeders themselves. The monitoring of these butterflies is done on a daily basis, with a program of butterflies to be selected for breeding for weddings/functions, according to orders received from our clients. 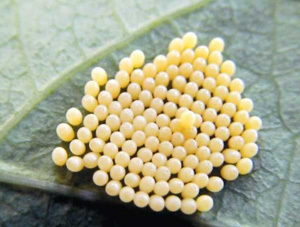 These eggs, because they are harvested at the time of being laid, have not had the chance to be victims of any form of parasites such as wasps, house flies or tiny maggots. These are cared for in a specialized egg chamber that is weather controlled by the breeder of this batch. The eggs are counted and check thoroughly for damage, while the leaves of the host plants are checked for any funguses or parasites that may have a detrimental effect on the freshly laid eggs. Care is taken not to contaminate any of the host plant material or egg breeding containers with any sort of detergent, soaps, dishwashing liquids, washing machine clothing detergents and the like. These will all have a detrimental effect on the eggs and larva to be. When these larva hatch they are cared for by the breeder who has a passion for the welfare of these to be butterflies of the future. 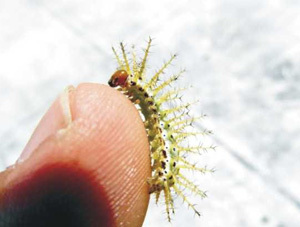 Each individual larva is inspected to make sure that they are perfectly healthy. The first two days after they are born is a sensitive period for the new hatchlings and usually must be left to their own devises, to gain the first basic strengths they need from the chitin egg shell they need to eat. During this period they may not be disturbed. 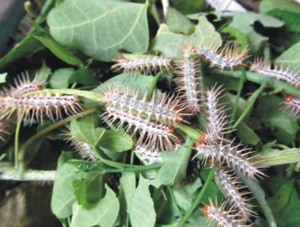 After this period you will find them becoming active and feeding on the leaves provided. Now our real work begins. 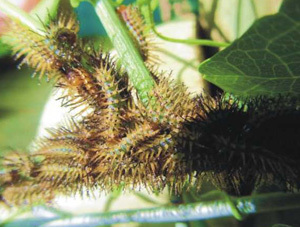 As these larva thrive they are fed three times daily to make sure that they do not pick up funguses from any frass left behind in their specially designed breeding containers, as these will form funguses which are deadly to their health. Fresh food and a clean house is what we all desire – so do the larva. At this stage of growth they tend to eat alot more, therefore make alot more mess. They stay together in a cluster for their own protection, being small and vulnerable to parasites – part of their defence strategy – for their survival in the wild. 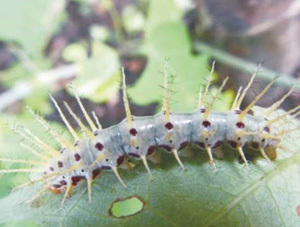 As these larva reach this stage one can identify if there are any that would have problems, such as deformities due to being injured through the breeding period. If there are any these are removed to another breeding facility in which care is taken to bring them through to become butterflies, mate and have the opportunity to lay eggs for the next brood of butterflies in its gene pool. These breeding facilities are essential for the breeding of these butterflies that would be released back into the wild, in which new DNA specimens are collected for future breeding stocks. At this stage they really begin to eat alot and sometimes have to be fed up to five times daily, with supper being the main course (much more food to eat) as they are nocturnal feeders (eat alot at night). This is around 7pm in the evening. Their fresh food is carefully selected, then washed in rain water to remove any parasites, funguses, or any other unwanted dirt from the leaves and stems of the plants. 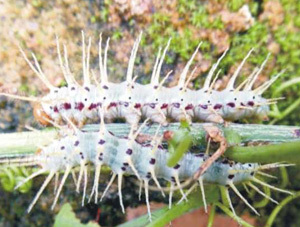 The use of rain water is essential as it does not carry any chemicals that could be harmful to the larva. This may take several hours in preparation for the next days feeding. This is the crucial stage for all the larva in question and they have to be monitored consistently. A special light is put on in the evenings near the hatcheries as they are in this state looking for a place to pupate. The light seems to guide them to accept the process (as if they know there will be sunlight for their wings when they hatch) and they do need it. They start eating alot less as their bodies start the process of metamorphoses – becoming dormant and waiting for the changes to take place. At this stage they must be handled with extreme care as they become much delicate. They start looking for a place to pupate. They are now removed to the hatchery where they will become pupae. Here I am – ready to be born in a specialized nursery for newborns. I am being watched every day by my breeders, to see that I will be okay. They watch my transformation until the day I am born. They place me in a sun room for my wings to harden and when I have passed the test of being 100 percent, I am carefully packed into my chamber (packet) and sent to a place I can call my home – I hope that it is near you. SABBA will provide you with butterflies for any occasion, being it a wedding or an engagement. We will breed these butterflies that are found to be “locality type” butterflies in your area. We will rear them from eggs and care for them in our nurseries, feed the larvae until they become big and pupate. 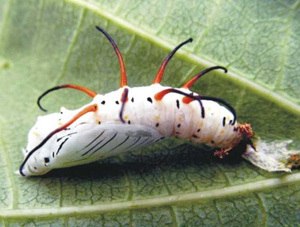 We transfer the pupa to our hatcheries and have timed your butterflies hatching within a few days before your function. The entire breeding process takes us up to 12 weeks to breed them, depending on the species of “locality type” in question. We then package the butterflies in specially folded envelopes to protect the butterflies from dehydration or damage.